Happy birthday to an amazing curvy-spined man! This past weekend was a nice chance to just BE together. *ahh* We took a weekend trip to Ann Arbor for my husband’s 40th birthday to celebrate being a family, splurge on some downtime together, and re-unite with friends we used to go to college with. We took our kids around the University of Michigan campus and ate at our favorite places. It was truly a nice time and a reminder that you can still act young even when you aren’t a 20-something college student anymore. 🙂 The pinnacle for my husband was our afternoon of laser tag!! He’s such a rebel (*insert dripping sarcasm here*) that it was actually the same thing he did at his bachelor party – laser tag, followed by the Original Cottage Inn pizza. Yes, he was wild and crazy! 🙂 It is just a reminder, though, how important my husband has been to me throughout the last 18 years or so. He walked me through some dark times when I was young (after the death of my Mom) and he has been steadfastly dependable as a husband. This came in very handy after our daughter’s Scoliosis diagnosis (and later, our son’s). We could bounce ideas off each other, share the burden of decision-making, and team up to get our kids the best treatment possible. I’m not sure what I would have done without him – there are times when I just can’t think objectively anymore and I rely on him to put perspective on things. And, the fact that he is a Scoliosis patient himself adds an extra layer to his helpfulness. One of our kids asked this weekend “Dad, why is your Scoliosis not under control?” We kind of laughed – because he was never braced, they didn’t understand that his IS under control – he takes a lot of measures to keep his back pain from his 26 degree curve to a minimum – he eats healthy, exercises daily, keeps his weight down, spends time to massage his muscles on the foam roller (or baseball), and he works to keep flexible. Because he has always done these things to keep his Scoliosis in check, our kids didn’t realize that he actually works at it – they just thought it was something he had but did nothing about. For those of you who are battling this disease on your own, or who is at odds with a spouse over the best treatment for your children, know that there is help out there for you. Find a buddy to bounce ideas off, read and ask questions on various blogs, start building a team of medical professionals, and remember you can always email me. I realize that not everyone is as blessed as I am with an in-house support network, but know that you are not alone. 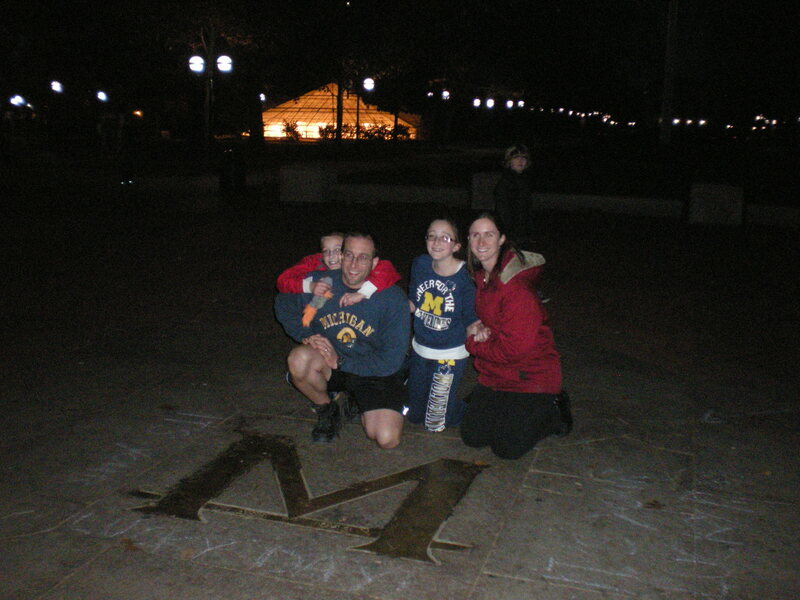 Our family, posing next to the M in the middle of the “diag” on the Central Campus of the University of Michigan! Go Blue! This morning was for our family what most parents of Scoliosis patients dread – the 4-month checkup with the orthopedist. When we first started going for checkups (especially right after my daughter’s curve progressed to a 67 degree curve! ), I would literally lose sleep for days before these appointments. By the time we started taking our son along for his newly diagnosed Scoliosis, I had become “used” to it. Or, maybe just numb to it…I am not sure which. But, somewhere along the way, I stopped losing sleep and just turned it over to God. I mean, I felt like I’d turned it over to God before, but if I lost sleep with worry, I really hadn’t done a very good job, had I? But, last night, while checking some last minute facebook before turning in for the night, I let my mind wander into those dark places again and it took me quite a bit longer than usual to drift off to sleep. It is a discipline, this turning kids over to God thing – I mean, we say we do it, but we keep worrying anyway. Last night I started to worry again, so I literally had to force myself to fall asleep praying and I also requested extra prayers from my facebook pals (who NEVER disappoint). And, the result at the appointment? The.Same. Both are the same as the last couple times we’ve gone. I don’t know why I thought this time would be any different. Well, to be completely honest, my son’s curve (which x-rays showed last visit had reduced from mid 20 degrees to about 11 degrees), has now been declared by one of the best Doctors in the field to be “too small to measure.” We are continuing his nighttime bracing in his Rigo-Cheneau brace, but for now he is looking REALLY good. PTL! My daughter is the same – mid 50 degrees. *sigh* I guess I stopped hoping for improvement (especially after we got so much improvement when she went into her R-C brace), but she does get disappointed when she sees her “annoying little brother” get all the improvement. I just kind of smile my half-smile at her, while thinking to myself once again “I wish you would have done something SOONER with her!”. There is nothing either one of us can do about it now, so it doesn’t help anyone to dwell on it. And, we are very pleased she hasn’t gotten worse, believe me! This is, however, the first time that she has complained of pain and discomfort in her back prior to an x-ray. We always keep her out of brace for 24 hours before an x-ray, to get a more realistic picture of the curve, and by the time the 24 hours was almost up, she was uncomfortable. But, all in all, we are happy with the results of our visit and are happy that we can “keep on keeping on” our adventure with no immediate bumps in the road. Inspiring story of an inspiring Scoliosis patient. While doing some general online research for future blog post ideas, I came across a very inspiring story from last June about a 14-year old girl named Lauren Stover. Lauren, a competitive swimmer with a tenacious work ethic and responsible approach that exceeds her years, has had a lot of success with non-surgical approaches to treating and improving her Scoliosis. In February of 2010, she had about a 27 degree lumbar and 23 degree thoracic curve. While these are considered moderate, she saw a rapid increase in less than a year (from approximately 13 degrees). It seems that she was smart enough to realize that a proactive approach would be best. Although she balked at surgery, she also felt bracing would prevent her from pursuing her sports and that her spinal muscles would atrophy (a common misconception, and one I know for sure to be untrue). With the help of her supportive and inventive parents (who helped find even more solutions for her as they went along), she was able to pursue treatment at the CLEAR institute, which is an intensive program based out of Lancaster, PA. The CLEAR program is similar to the program we do with Dr. Morningstar (the inventor of the ARC3D program). Both are proactive approaches to re-training the nervous system, but the CLEAR program is a much faster, more intensive approach. Unlike most young people with Scoliosis, Lauren was experiencing back pain associated with it. After working through the many side effects of such an aggressive program, she found great relief from her pain and a significant reduction in her curve. She also worked with local chiropractors and massage therapists throughout her treatment, as well as keeping up with her CLEAR treatments at home. It is a daily commitment on her part, and one she takes on with the responsibility of one much older than her 14 years. The interesting thing about this is that I found this article after reading several from the “mainstream” Scoliosis treatment avenues, that claim that exercise therapy isn’t helpful in reduction of curves – but clinics like the CLEAR institute and the Natural Wellness and Pain Relief Centers of Michigan (Dr. Morningstar) can show success stories every day. I felt hope once again after reading nothing but surgery, surgery, surgery for almost 2 hours. One thing that REALLY impressed me about Lauren is her work ethic! She really took ownership of her problem and worked hard to overcome it. I hope that one day my daughter will be so responsible (although she is only 11 still). I always tell her that if she wants to avoid surgery (which she does), she will need to work at keeping her curves at bay for the rest of her life (the reality is that even if she DID have surgery the same would hold true). It is such a comfort to know that there are so many pro-active treatments in the area of Scoliosis and that older youth and adults can also experience great success from these treatments. Not ALL will, but there is hope for many. Thanks, Lauren, for sharing your story through your local paper and for being a Scoliosis inspiration!